What is automated driving? | What Car? Mercedes' Dr Hans-Peter Schoener explains: 'Automated driving is about handing over control to computer technology. Mercedes fits a computer and robot into a standard production car, which can then steer the car and control its accelerator and brakes. Engineers can then programme a route around the company's test track close to its Stuttgart base. The route is downloaded to the car's on-board computer, allowing the robot to 'drive' the route as many times as required. Satellite technology ensures the car never deviates more than 2cm from the programmed route. 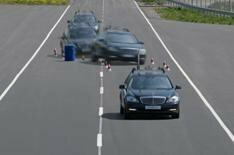 Mercedes can test up to five cars at a time on its track, driving at speeds of up to 43mph, over jumps, around cones or through intersections.